October is National Bullying Prevention Month - Bullyproof your child! Well, every October schools and organizations across the country work together by observing National Bullying Prevention Month. The goal of the National Bullying Prevention Month is to encourage communities, schools and organizations to work together to fight bullying and cyber-bullying by increasing awareness of the prevalence and impact of bullying on children of all ages as well as in adults. 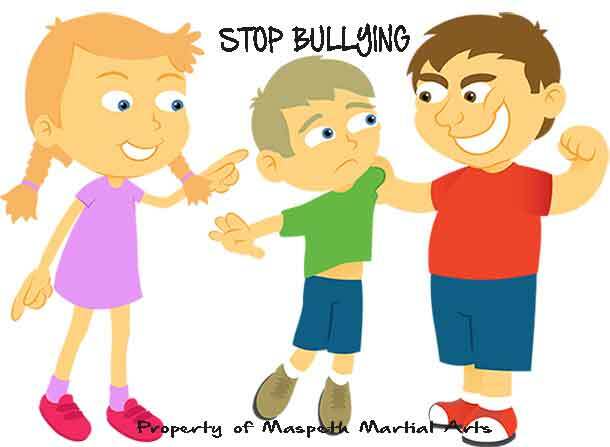 Maspeth Martial Arts applauds the work of organizations such as http://www.stompoutbullying.org and http://www.stopbullying.gov and the like. Please visit them at their website to assist you with important information about Bullying and Bullying Prevention. At Maspeth Martial Arts we offer Bullying Prevention classes for children ages 4 & up. Please visit us at www.maspethmartialarts.com or call us at 718-255-1993 to find out when our next class is.